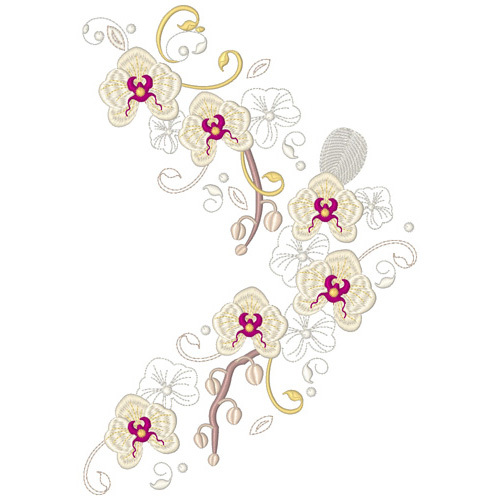 As I complete the final set in the Orchids for Ruth collection I was trying to decide what new colour scheme I could use for my final stitch out for this blog and what fabric I should use. I have stitched on ivory, brown and moss green silk dupion and have experimented with several colour schemes for my threads. When I need inspiration for the colours of flowers I usually search photographs online of the particular species. After discovering some beautiful photos of orchids I decided to do something quite bold. After my trip to New Hampshire, USA visiting my good friend, Pamela Cox, I think I have enjoyed the autumn much more this year than ever before, and those vivid colours are still dancing around in my head. 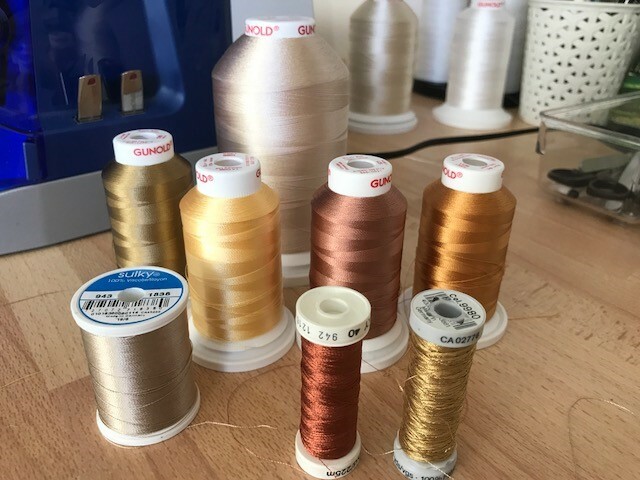 So it is probably no surprise that I have chosen yellows and oranges with a hint of gold metallic thread for my embroidery. I really think that there are some outstanding designs in this final set and it is hard to choose which one to feature in this blog. 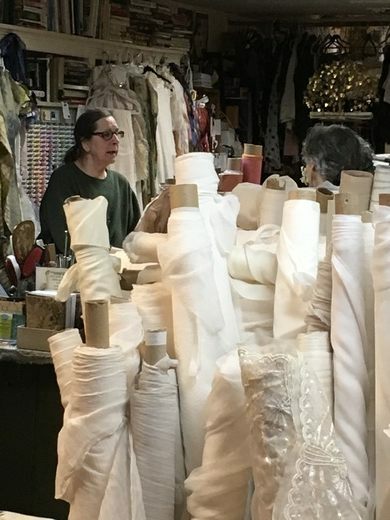 Visiting another country or area, always gives a me a huge opportunity to search out new shops for my fabric and lace stash and this trip afforded a drive into Brattleboro, Vermont to a very special shop called Delectable Mountain cloth. 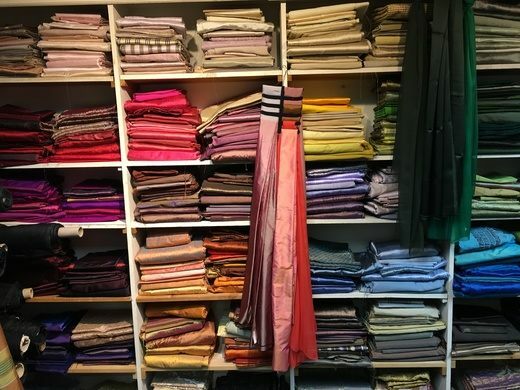 The shop describes itself as being an “extravagant adventure for natural fiber textile enthusiasts”. Well the name alone is enough to conjure all sorts of possibilities but this was really an Aladdin’s cave for anybody who loves buttons, lace, silk fabric and vintage handkerchiefs, gloves and mats. The two ladies in the shop were very friendly and helpful, and we had a marvellous time visiting with them and exploring the treasures in their shop. Can you imagine how exciting it was to see all this silk? I was so glad that Pamela took me there. The collection of buttons in little glass dishes were very impressive too. I came away with some tiny buttons for my crazy quilt blocks, an antique embroidered handkerchief, several lengths of lace and silk dupion but also a couple of yards of beautiful honey coloured silk tussah. I have never seen this silk on sale before so it was irresistible. It is created with silk from wild silk moths that have feed on all sorts of vegetation, so it is very slubby and comes in natural colours. I choose to use this special silk for my design. On hooping it I was aware that because it is so slubby and rather loosely woven, it was important to make sure it was not distorted when applied to my stitch and tear stabiliser. 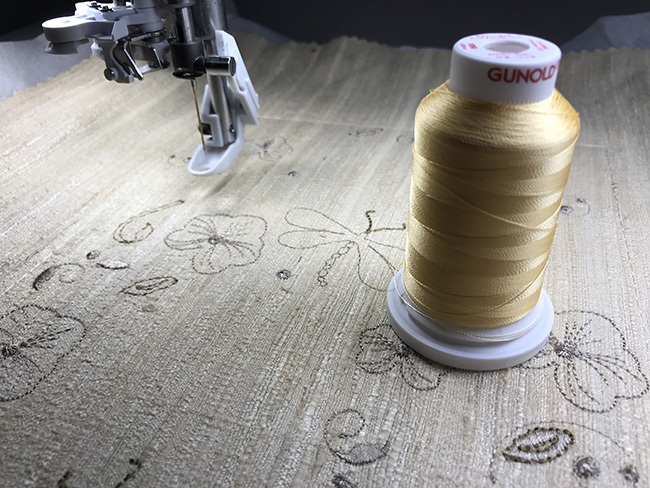 It soon became apparent when the first colour began to stitch out that my Sulky Rayon 1071 off white thread was lost in the fabric, so I quickly stopped my embroidery and threaded up Sulky Rayon 40 wt (SR) 1838 Cocoa cream and returned to the beginning again. This involved stitching over the white of the silhouette of an orchid but it almost covered it and I was a great improvement and I was delighted with the new colour. At this point I decided to change the second colour too in my stitch out from SR 1082 Ecru to SR 1265 Burnt toast. 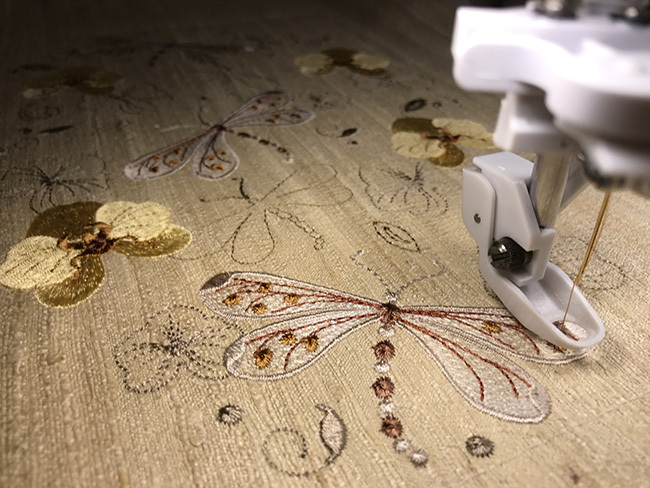 To avoid these sort of problems it is best to always place your threads on the fabric and see how a single threads looks when laid across it. If it disappears then you know it will not show very clearly especially if it is just running, triple or back stitch. 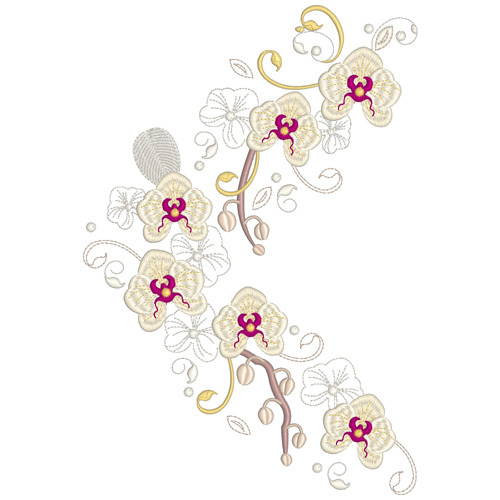 Now you may have noticed that the dragonflies in this collection are listed separately in the stitch out even though they use the same colours as the orchids? I have done this so you have the option to change the colours which is what I did this for this design. 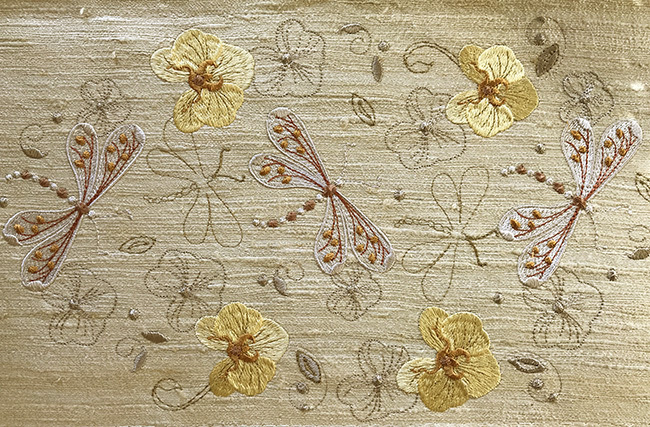 I still used SR 1071 off white thread for the base of the dragonflies but used the following threads to complete them: SR 1216 Medium maple, SR 508 Sand, SR 521 Nutmeg and SR 1126 Tan. As you can see on this 12″ x 8″ finished design the fibres have were not distorted in the hooping or during stitch out. The embroidery was done on 2 layers of stitch and tear. I was delighted with the end result and as this is precious fabric I must decided how to use it. Any ideas? This is another special design in this new set and it makes a beautiful combination when a a pair are mirror imaged. Imagine this on the back of a silk jacket! The 12 designs in this set will be released today, November 2nd, 2017. I am planning to do a crazy quilt with my other purchases and will share that another time. In the meantime do enjoy these new designs! 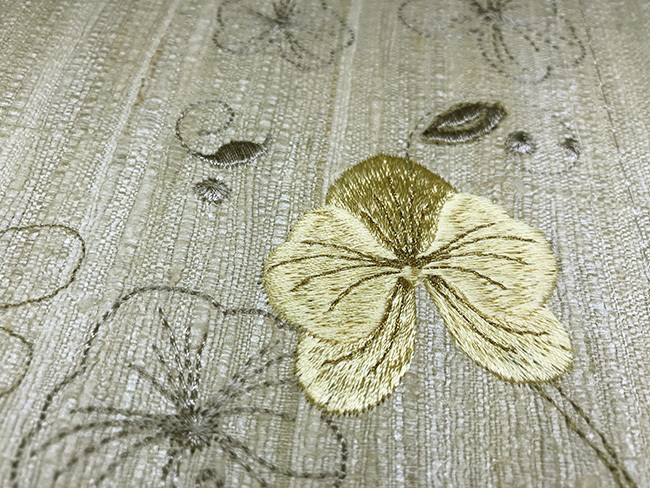 This entry was posted in Discussing machine embroidery, Embroidery projects, New Designs and tagged colour changes, embroidery on silk, The importance of colour. Bookmark the permalink. WOW, this color scheme is really gorgeous! A little outside your usual but I love it! Thank you so much. I had such fun doing this and the stitch out will be treasured to remind myself of this incredible holiday and my visit to Delectable Mountain cloth. I think there will also be a new collection at some point based on my visit. Love, Love the new colours. Fall is my favourite time of year and this year, in Ontario, the colours were spectacular, so glad you ventured into these golds and reds, very rich and warm looking. Great stuff Hazel, wish I had been at the silk store with you!! One visit was really not enough. I hope I am able to go again. The colors you choose were just beautiful! Absolutely stunning and that silk is beautiful – I just love your colours! The colors are beautiful. Thank you for the tour of Delectable Mountain cloth–it sounds like a lot of fun to visit there! Wow, love, love, love those colors! It never ceases to amaze me all the different colors of flowers they seem to come up with each coming year. Loved your tour of the church….beautiful! Thanks for sharing. Oh my goodness! I absolutely love this stitch out! I am also a fan of Orchids and even more so Dragonflies! I really wish I could find a store locally that carries the silk like you use. But, the hunt is on, I will find someone that carries it. Hazel, you’ve out done yourself with this set. I just love it! Very elegant in its own way! The ladies did say that they send out silk but you cannot buy it on the website. You will need to contact them direct. I am sure they will help you.